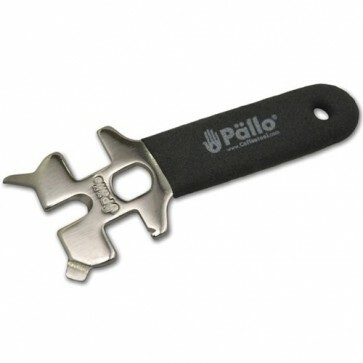 Pop it, twist it, scrape it, screw it...the Pallo Caffeine Wrench will let you do all that and more. This black-and-steel barista tool will not only save space in your kitchen, but will also help you manage common espresso brewing tasks, such as using it as a filter basket popper-outer, steam wand wrench, bottle opener, light-duty screwdriver, milk residue remover, soft gasket probe, group bolt wrench, and thermometer calibrator, to name a few. The tasks you can accomplish are endless. Maintain your espresso machine and equipment easily and efficiently with Pallo's Caffeine Wrench. Size Matters - The Caffeine Wrench has three different sized wrenches: 8mm, 12mm and 13mm sizes. Pallo Says - The gasket probe can be used to remove soft gaskets for maintenance and replacement from many different groups. If your group assembly is held together by a screw or bolt, chances are the probe will work nicely. You'll have a tough time removing the gaskets from a pressure fit type group like the E-61. It's much better to use a scratch awl or similar tool, especially if the gaskeket is petrified. Bendy - Some group assemblies are held in with a 7mm or 8mm hex bolt. The bend allows for easy access to this area. Save Your Fingernails - The basket pry makes it easy to pop the basket from your portafilter handle. Slide the basket-pry/screwdriver under the lip of the basket and turn the tool like you would a house key. Better than any improvised kitchen tool, using this wrench to pop out stubborn filter baskets from portafilters is where this tool gets the most use at SCG. We salute ingenuity! The notch in the 12mm is a bottle opener. Need we say more? Cheers!